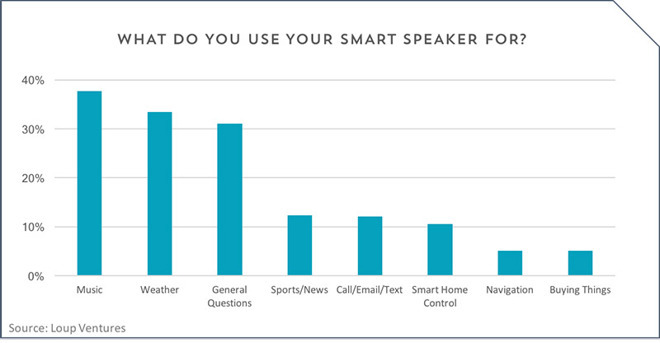 Of the 520 U.S. consumers polled as part of the survey, 31 percent of respondents said they owned a smart speaker, whether it be an Amazon Echo product, Google Home, Apple HomePod or other device with AI capabilities. Further extrapolation found 55 percent owned an Amazon Echo device compared to 23 percent for Google Home and 3 percent for HomePod. Surprisingly, 15 percent of respondents said they use a product powered by Microsoft's Cortana, a virtual assistant that has not enjoyed wide adoption by speaker OEMs. According to Munster, with penetration at about one-third of the U.S. population, the results roughly resemble the current market landscape, save for a "slight" overrepresentation of Cortana owners and underrepresentation for Echo. Perhaps more important is customer satisfaction, which floated to a lofty 89 percent, excellent for a new device category. Breaking it down, the survey found 59 percent of respondents were "satisfied" with their smart speaker, while 30 percent were "very satisfied." For Munster, the high satisfaction rates correspond to relatively low expectations. As evidenced in survey results, a majority of users demand very little from their smart device. The top three use cases are, in order, playing music, checking the weather and asking general questions. Less than 15 percent of users say they access other functions like checking sports scores, placing calls or texts, and controlling smart home accessories. Navigation and purchases fall even lower on the chart at around 5 percent. "The top use cases for smart speakers today make sense because they are well defined and they work consistently," Munster writes. "This works really well for simple google-able' questions or fetching info from a weather app, but as the use cases broaden, it is not always clear where to send a query." Use cases are expected to multiply as companies like Apple and Amazon work to broaden their respective AI voice assistants. Current device iterations are merely a stepping off point to a more comprehensive ecosystem in which multiple devices and services are connected and controlled by a user's voice. If and when voice controlled hardware takes over, it will represent a paradigm shift from current UI applications dominated by touchscreens. Apple is well on its way to lead such a revolution with HomePod. The smart speaker boasts an array of beamforming microphones and adaptive audio technology to better detect and respond to user voice commands, while onboard components offer access to Apple's various connected platforms like iCloud, Apple Music and HomeKit. As AppleInsider noted in its review, all that is missing is a smarter Siri.